For teachers who return to teaching in the schools, I know that the most difficult thing to do is to master classroom management. 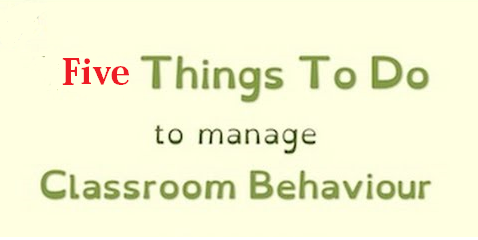 But, you know, classroom management is not to be strict but it is simply to be organized. If you want to have a classroom run smoothly, you should set up a structured learning environment where certain behaviors are praised and others are discouraged. I think the following five procedures will help you teach in a quiet classroom with students attentive and observant to you. Create a friendly but respectful relationship with your students. This kind of relationship is very important to create learning opportunities. Start at the door with a smile, greet your students and shake hands with some of them. Use your students’ names and actively praise them. Know them and their needs and use this knowledge to adjust your teaching methods. If you have a good relationship with your students, you will be able to push them harder and further to learn because they will trust you. Train your students on how to understand and learn in the classroom. You should have a learning philosophy that guides your teaching methods in the classroom; tell it to your students. Tell them that you don’t expect them to be at the same level in learning but add that you have some steps if they follow they will learn. Write these steps on the board in the first period or spread over a printed copy of them. Don’t forget at the end of each period to summarize what students should learn to give each student the opportunity to practice self-evaluation. Prepare your mind and materials well. Managing the classroom includes managing the time minimizing lost time in activities like handing out papers, taking attendance and announcements. You should protect your time and increase the time spent on learning. You will not be able to do so unless you are well mentally prepared. You should know how to transition students from one activity to another without wasting time in order not to give them any time for side talks. Anticipate your students’ behavioral problems. Anticipation is not enough, but you should put in your mind the solutions. Don’t go ahead directly to punishment but build activities or ask questions that can lead students to return to the lesson and attention. Establish behavioral standards from the first day. These standards should hit the main points regarding showing respect, communicating correctly and coming prepared to learn. Explain the standards of performance, as well as the limits of behavior. Practicing classroom management should begin at the start of school and throughout the year. It needs to be flexible, tolerant and smiling to manage your students. These are my priorities for managing classrooms, what are yours? thanks alot for the blue-prints which will lead as in the classroom activities?